The bony thorax, made up of the ribs, thoracic spine and the sternum is frequently under appreciated. Two of my favourite chiropractic teachers were very keen on adjusting ribs. One of them used to tell a story, that has stayed with me, about a client with at least a two year history of persistent, intermittent, and distressing abdominal pain. There were lots of investigations via her doctor, unsuccessful medications and diet interventions. He described how one adjustment to the lower left ribs solved the problem. Ribs are often implicated in stubborn shoulder issues, hard to treat back pain, breathing restrictions, chest pain, organ problems and abdominal dysfunction. Seat belts and car accidents, falls, carrying heavy bags and children are common causes of dysfunction. Cracked ribs are famously painful and can hang around for a very long time. Orienting to the thoracic spine, the whole space of the thoracic cavity and its fillings and connections and following the inherent treatment plan is often enough to help clear issues. However a few times a year I find myself needing to focus on the ribs and sternum much more specifically in order to support change. At the back of Sutherland’s book ‘Teachings in the Science of Osteopathy’ there is a treasure trove of osteopathic techniques (Lippincott, H.A. 1949). You may remember it as the section with the slightly strange pictures of people sitting on Sutherland’s knee or of clients twisting and tuning as he holds the the body in a particular way. The language is very technical, it is all about ‘ligamentous articular strain’, and it is very easy to skip over. There is though an approach to working with ribs that I like and will discuss below. Ignoring the assumption that osteopaths are men, the second quote above sums up for me why it is useful to be able to relate in detail to the anatomy. An intelligent system will know that you know. If you understand and have a felt sense of the specifics, then change will happen much more quickly. You may not want to try the principle of the bolt and nut (in this case the bolt is the rib, held by the practitioner, and the action of the nut is the patient turning their spine) but being clear on anatomy and exploring Sutherland’s insight into how the rib can move in health will be useful. I try and be playful when I am focused on specifics, I try not to want things to change, at some stage I find that I can widen out my awareness to hold the detail in relationship to a wide field of action. That is actually the moment when things shift. But I often ask questions, try different hand positions and need to be clear on the anatomy before the right relationship emerges. As long as I can perceive when the system says no I find it is ok to be inquisitive. Cranial work is much more that just sitting hopefully in space with your hands over a general area. The structure of the body is not arbitary, evolution was very precise. We need to be skillful in our appreciation of the detail of the form. 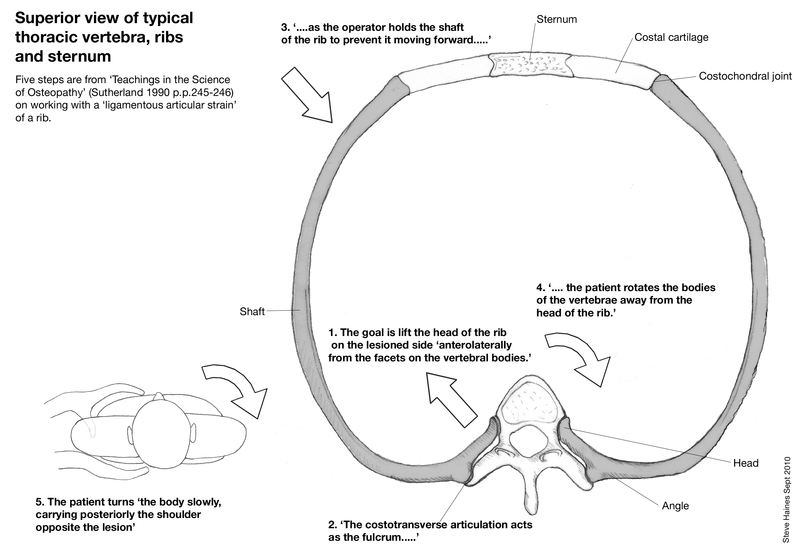 The diagram above attempts to summarise an approach by Sutherland to working with the ribs. 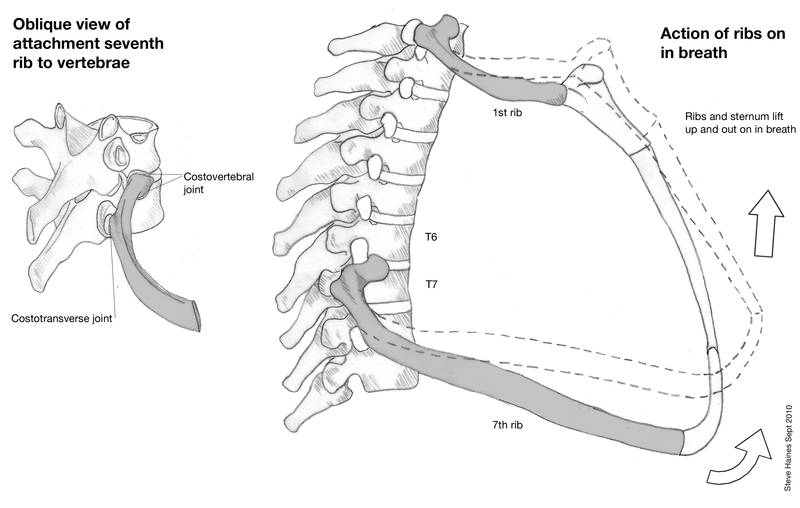 With my skills it’s fairly ambitious to be able to be so clear about using the costotransverse articulation as a fulcrum to open the attachment at the rib head. What I do like about the approach is getting the client to twist their spine. Whilst holding the rib (the bolt) I get them to twist both ways and, fairly arbitrarily, choose the twist that seems to help the most. This ‘turning of the nut’ by the patient really helps me clarify the anatomy under my hands. (If you get the client to twist towards you it probably opens the costotransverse articulation a little more). My upper hand is in contact with the shaft and/ or the costochondral joint, my fingers underneath the thorax are on the angle of the rib, slightly lateral to the spine. Another tip is to hold a few ribs and get the client to take big breathes to help you make sure you are holding the rib correctly – the downward angle of the ribs means your fingers are not directly above and below each other. The contacts under both hands should move together when they are on the same rib. Also, as the client breathes in and out it will help you be aware of restricted ribs, they often feel hard, fixed and tight. To treat: I will get the client to slowly make a twist until I get a sense of the rib, ask them to take a breath and hold the breath, I widen my awareness and then they breathe out. Sometimes I ask them to keep holding the twist for a few cycles of breathing. Then I ask them to let go of the twist. In the relaxed state I often get a strong sense of the the rib shifting laterally and taking up space, often followed by a surge in potency. It feels fabulous as the rib slides towards you, it has worked a treat for me a number of times. I hope it helps you too. Lippincott, H.A. (1949) The Osteopathic Technique of Wm. G. Sutherland D.O. in Sutherland, W.G. (1990) Teachings in the Science of Osteopathy. Portland, OR: Rudra Press. Sutherland, W.G. (1990) Teachings in the Science of Osteopathy. Portland, OR: Rudra Press. Sutherland describes doing it in sitting, I have always done it in supine. You can contact the angle of the rib medial to the scapula so it is not a problem. As a chiropractor I was taught that ribs only subluxate anteriorly and you thrust anterior to posterior with superior angle. Sutherland wants the rib head to go anterolateral, which is quite different. I just get a sense of the rib easing laterally and maybe a little anterior and the the whole segment feeling easier. Let me know how you get on.